KhanhHoa省位于南越南中部海岸. 它毗邻富安省北, DakLak和林同省西, and NinhThuan Province to the South. Khanh Hoa Sea is considered to be the deepest sea in the country with a coastline spanning over a length of 200 千米. With more than 200 islands of various sizes, KhanhHoa Sea adjoins a lot of international marine routes. 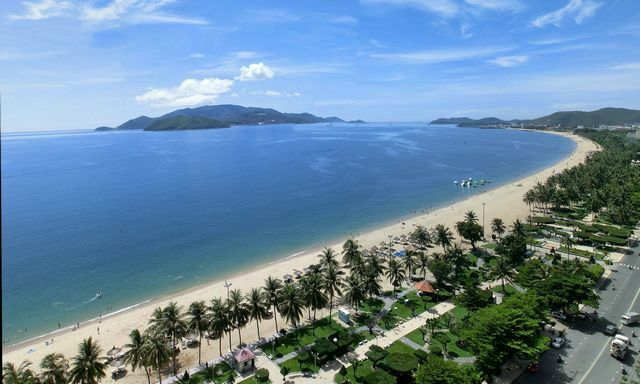 The fact that its coastline is home to many spectacular bays such as Cam Ranh Bay, 云峰湾, NhaTrang Bay makes KhanhHoa one of the most well-known destinations in Vietnam. 除了, its many inland rivers, among which Cai River and Danh River are most famous, also contribute to the province’s reputation in general. The climate of KhanhHoa is highly tropical. With an average temperature of 26.5oC, the weather is warm all the time in the plain regions. That is why tourism can have a very favorable condition to develop year-long activities and be active thorough every season. KhanhHoa also has a monsoon period with lasts from September to December (4 months in total). 然而, the area around NhaTrang city has such a privilege to experience the rainy weather for only 2 months a year. 从而, you can tell that tourism is even more popular in NhaTrang. 另一方面, the climate on higher regions such as Hon Ba Mountrain is pretty chilling and dry. If you go there, expect to encounter a type of weather similar to that in Da Lat or Sapa. The population of KhanhHoa Province is made up of mainly the Kinh ethnic group, but other groups can still be found there in relatively small numbers. They include Ra Glai, 手, Nung, Muong, and Cham. Among all of these small groups, the Cham has the most prominent culture with distinguishes KhanhHoa from other provinces. One example of this statement is the increasing popularity of Champa Kingdom: an ancient site where many valuable historical constructions still remain today. The natural and cultural potentials of KhanhHoa have been effectively explored in the last few decades, making the province a tourism magnet. 首先, you cannot leave out the majestic natural sites in KhanhHoa such as Cam Ranh Bay (one of the few harbors that have the best condition in the world), 云峰湾 (an artless, wonderful site with a temperate climate, ideal beaches, and diverse coral reefs, 等等), NhaTrang Bay (an internationally famous sea resort which is ranked as the 29th most beautiful bay in the world) and many other celebrated sand beaches. Tourists can also visit a plethora of historical destinations such as Cham Towers, Bao Dai Palace, Hon Chong, 等.